Year 5-Enterprise Day-A day in Politics-Thursday 21st May. Year 5 enjoyed learning about politics in our country, extending our knowledge of Britain`s current political parties and finding out how the House of Commons operates. We looked at how to debate effectively and held our own debate on the issue of `Should we wear our own clothes to school, rather than school uniform?` Some of our arguments were so persuasive that many children had changed their viewpoint by the end of the debate! We created our own political parties and designed logos and slogans to represent them. We wrote manifestos based on issues that we had chosen and then held a Hustings followed by an election in which we all voted for the party we felt would be the most effective. We all learned a lot about politics and demonstrated many important skills such as developing resilience and working well in a team. On Thursday 21st May we took part in Enabling Enterprise Day. We learnt about what a government is and how they make big decisions about our country. We formed our own political parties, made a manifesto poster and rosettes and planned our persuasive speeches. We then performed our speeches to the class and held a secret vote! An exciting exit point day for Year 1's "We Are What We Eat" topic. Year 1 have were very lucky to be invited to The Baldwin Restaurant to find out about serving food and drinks in a restaurant. We also made healthy wraps for our snack. We looked in the kitchen - they work VERY hard cooking everyone's lunch! We also saw where all the washing up is done - we were lucky as we didn't have to do ours! On Thursday 21st May Chilcote (12 children) entered a mixed pairs cricket tournament. The tournament took place at Moseley Ashfield Cricket Ground. The tournament was a knockout competition, with the winners representing the Baverstock Partnership at a Birmingham wide event. In the first game the children played against The Oaks ‘B’. They played really well, despite being very nervous. They won the match 237 v 182. In the second match they played against Yardley Wood ‘A’. The children were starting to find their rhythm and batted superbly, only dropping 1 wicket. They won the match 260 v 229. In the semi-final Chilcote played against Bells Farm. The children lost a few more wickets in this game but batted even better (on the balls that they hit). They then fielded the best that they had done in the entire tournament. They won the match 259 v 211. In the final they played against a very good Hall Green team. Hall Green batted first and they scored an impressive 238. Chilcote replied with some great batting and also finished the match on 238. The final was then decided on a ‘super over’. Unfortunately, Hall Green won the super over by 2 runs – 8 v 6. Well done to all of the children who took part, you did the school proud! Children sharing their manifesto with the rest of the year. Children delivering their political speech. Year 2 have been doing lots of different fun activities today. They have built their own political parties by creating their own names, designing logos and making rosettes. The children picked two issues that they thought were important to society and came up with their own manifesto. They then presented a political speech to convince the rest of the class to vote for them. Both classes then held an election. After all the votes were counted a winning party was announced. Well done year 2- you are officially politicians. On Thursday 21st May 2015, we enjoyed learning about politics and the last general election. Then we went back to class got into parties and did some FUN activities like a quiz, a debate and we created a manifesto in our party groups. We thought about how we would like to change things like schools, hospitals and the fire service if we were voted to lead the country. In the afternoon we finished of our manifestos and then we did speech in front of the class. We had a amazing day and all the all the children in Year 3 loved it! One child thought it was awesome! One child thought it was brilliant! One child thought it was fantastic! We had a big class vote at the end! One of the party's were called Green Team Party. On Tuesday 19th May Chilcote (8 children) entered a cross country running competition. The competition took place at The Oaks Primary School. The competition involved the children completing 4 x 400m laps as a team in the quickest time. The girls went first and ran really well. They finished the race in third place, out of 6. They completed the 4 laps in an impressive 7minutes and 9seconds. The last runner equalled the third best lap of the day too! The boys ran second and did a fantastic job too. They finished the race in third place out of 7. They completed the 4 laps in an impressive 6minutes and 29seconds. The third runner equalled the third best lap of the day too! Well done to all of the children who took part, you did the school proud! Also, a big thank you to the parents who came to watch and help marshal the event! On Monday 18th May Chilcote (20 children) entered a golf tournament. The tournament took place at Tidbury Green Golf Club. The tournament involved the children completing 7 golf skill challenges and scoring points from each. The year 6 children played really well and they particularly excelled at the putting challenges. They scored a record 333 points on one of the challenges! They finished the tournament with 906 points, which put them in first place, out of 4, for the day! The year 4 children played extremely well too and they also excelled at the putting challenges. They scored an impressive 230 points on one of the events! They finished the tournament with 587 points, which put them in first place, out of 2, for the day! Well done to all of the children from both year groups for a fantastic performance and for winning their respective competitions! Our school had a lovely treat today when Mrs Brookes (our Upper strings and Orchestra teacher) and all her pupils played for us in a fantastic assembly demonstrating their latest pieces. We enjoyed music from our oldest string players in Year 6 who are working towards their Grade 3 and 4 exams this term to our youngest players in Year 2 who have only been playing for 8 months. The Orchestra (including our older recorder players, guitarists and brass players too) also performed to a high standard. We are very lucky at Chilcote, as we are one of only 3 Birmingham Primary schools to have a successful and well supported orchestra. Well done to you all and thank you for showing us the results of all your practice and dedication to your instruments. A big thank you to Mrs Brookes too-without whom none of this would be possible. We look forward to sharing your music with parents on Monday 22nd June and Wednesday 24th June at our school summer concerts. Over this half term we have watched as our class caterpillars have changed into their chrysalis and then transformed into butterflies. Today was a beautifully sunny day, so we decided it was time to set them free in the school garden. We have loved looking after them and making sure they are happy by feeding them fruit and being gentle with their home. We enjoyed waving them off as they flew away! We have had a very busy week designing pizza. On Tuesday we tried pizza you can buy in the shops (we really enjoyed doing that!). On Wednesday and Thursday we needed to think about our own ideas of bases and topping. Some of us came up with designs for sweet pizza - cake base with chocolate, marshmallows and sprinkles on top (Yum!!) Today we made our own pizza. We really enjoyed doing this. The smells coming from our classrooms were delicious. Which topping would you choose? We even made some for Mr. Gale and Mr. Cross - they really enjoyed them! On Wednesday we had the last session of our Forest School journey in Year 2. We invited our parents to come along with us and share in some of the activities that we were doing. 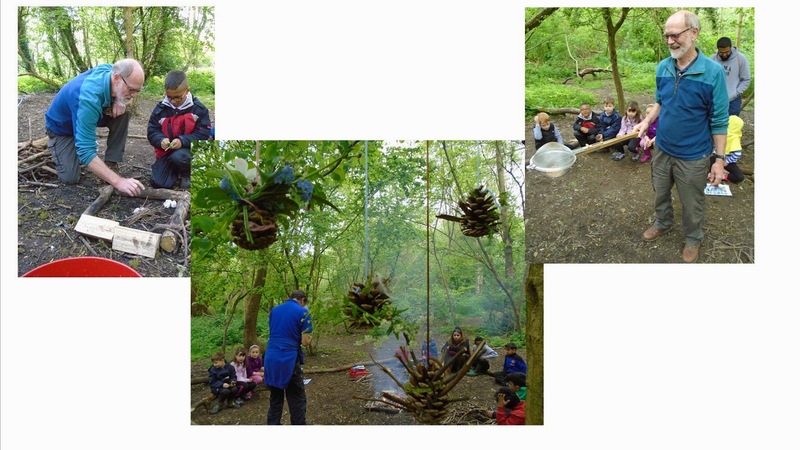 We had the chance to meet a tree, identify the many trees that are in our Forest School environment and to make pine cone decorations for our Forest School classroom. As a special treat, we got to enjoy a campfire; we toasted marshmallows and watched with amazement as Graham used the campfire to make some delicious popcorn! On Tuesday 5th of May, for speed awareness week Year 3 took part in an exciting project with local police officers, helping them to make Hall Green roads safer. On the 24th of April Year 4 also took part in the project and witnessed cars speeding on the road at over 50 mph! The year groups found out about the dangers of speeding and learned some worrying statistics about what can happen if people drive above the speed limit. Year 3 and 4 also learnt that driving with our parents, if they are speeding means in future we could be become speeders too. Then Year 3 and 4 went out on to Baldwins Lane with the officers in small groups, and using a pro laser gun and other equipment. The pupils identified speeding vehicles and collected information about drivers who were driving above the speed limit. Back in the classroom, Year 3 and 4 wrote letters to the drivers, informing them that they were going above the speed limit, highlighting the dangers of this and also the consequences of driving too fast; they could get a fine, points on their licence, or, in the worst case scenario, be responsible for causing injury to another person. The police are going to use year 3 and 4's letters and send them to the drivers that were stopped. The children have also been told to expect some replies! Both year groups had really interesting and exciting mornings with the police officers and it was great to help make the local area a safer place.